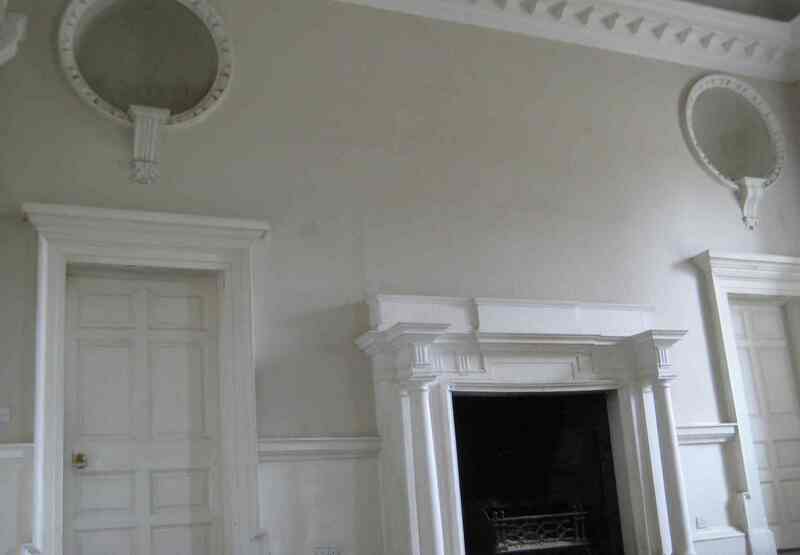 Since first writing of Bellamont Forest (La Belle au Bois Dormant, January 21st), I have heard from a number of readers concerned about a set of 18th century marble busts formerly in the house. Although none can be verified with absolute certainty, various tales exist concerning the origin of these busts. It is said, for example, that they represent different members of the Coote family responsible for building Bellamont. It has also been proposed that they were brought back from mainland Europe after a Grand Tour and installed in niches in the entrance hall and first-floor landing specifically created to accommodate them. What can be confirmed is that the busts were already in the house more than two centuries ago. Sir Charles Coote, an illegitimate son of the last Earl of Bellamont, produced a Statistical Survey of Cavan in 1802 in which he wrote of the house, ‘The entrance from the portico is a lofty hall, thirty feet by thirty, which is ornamented with statuary in regular niches…’ Likewise in 1835 Lieutenant P. Taylor’s statistical report on the parish of Drumgoon includes a description of Bellamont with the observation, ‘The portico enters into a lofty hall 30 feet square, tastefully ornamented with statuary…’ I am grateful to Kevin Mulligan for bringing these two references to my attention. The earliest known visual evidence of the busts’ presence in the house comes from a photograph album presented by Richard Coote to his neighbour Lady Dartrey in September 1870. Now in the possession of the National Library of Ireland, it includes a view of the entrance hall (then serving as a billiard room), which with that institution’s permission I reproduce above; one can assume the picture was taken at some date prior to 1870 (and incidentally, how fascinating to see the hall decorated in such high-Victorian style). A photograph in Volume V of the Irish Georgian Society’s Records (see top of this piece) which was published in 1913 and shows the busts in their niches appears to be a section of the earlier picture. Thereafter it would seem the busts remained within the house through changes of ownership – until last year. Following the death of John Coote in January 2012, the busts were removed from Bellamont. After representations from the Irish Georgian Society, in September Cavan County Council issued notice to a number of parties requiring the busts’ return. To date this has not happened. I do not intend to become immersed in legal niceties, not least because the matter could yet go to litigation. On the other hand, the busts’ removal does raise a number of significant questions about what constitutes a permanent fixture within a historic building and what should be deemed a transitory decorative feature. In the case of the busts no violence was done to the house during their removal, for which nothing other than a step ladder was required. In other words, unlike say when a chimneypiece is taken out, the structure suffered no damage. It is worth noting first that these are only guidelines; the document’s opening page counsels that what follows ‘does not purport to be a legal interpretation of any of the Conventions, Acts, Regulations or procedures mentioned. 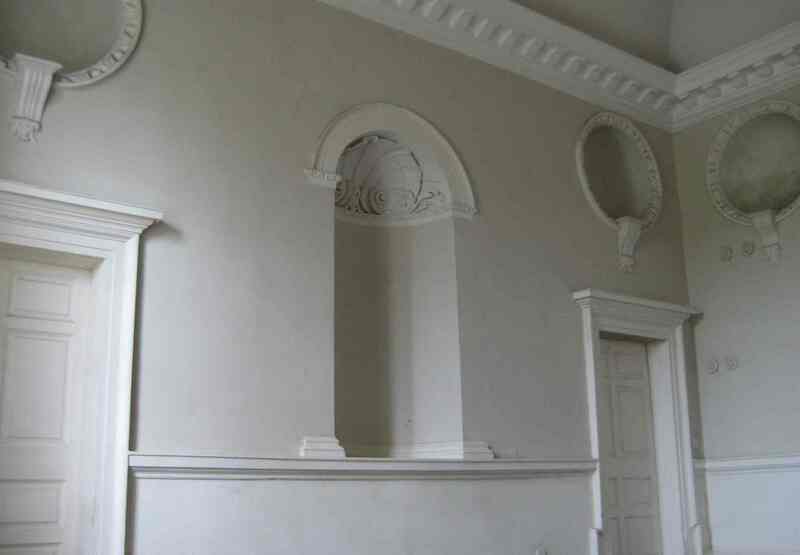 The aim is to assist planners and others in understanding the guiding principles of conservation and restoration.’ In addition, the advice offered is that works of art can only be deemed fixtures provided there is proof ‘they were placed in particular positions as part of an overall architectural design.’ In the case of the Bellamont busts the lack of such conclusive documentary evidence is an obvious problem for anyone championing their return. We do not know the artist responsible, or the date of their creation. Were they commissioned or bought ‘off the shelf’? Can it be conclusively demonstrated the niches were designed to accommodate them? 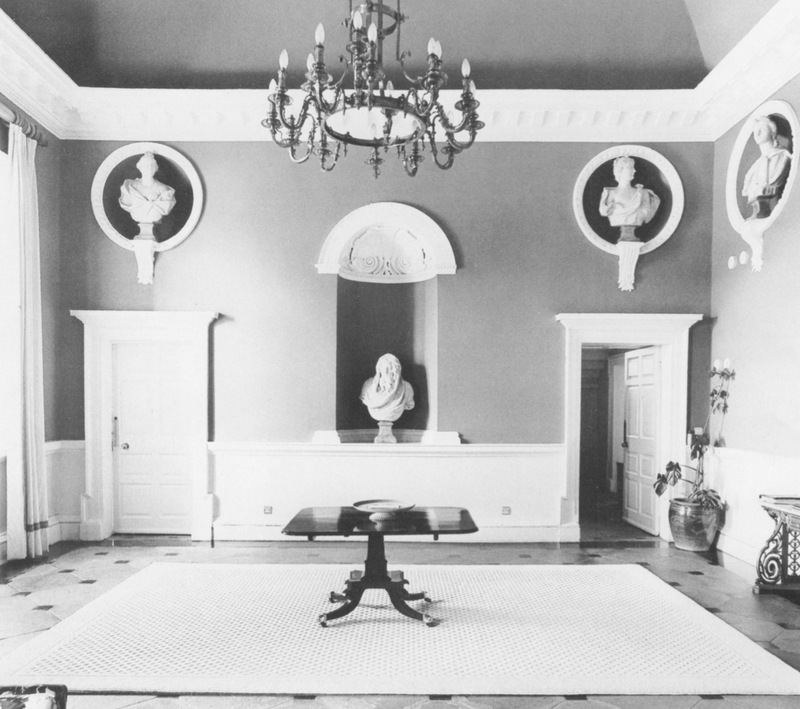 The next photograph shows the entrance hall in the mid-1980s not long before Bellamont Forest was bought by John Coote; over the intervening century every aspect of the room’s decoration has changed except for the busts. I am unaware of any similar case to the Bellamont busts in this country at the moment or indeed in the past but it has to be said that recent precedents in Britain are not encouraging. In 1990, for example, Canova’s marble statue of The Three Graces, which had been commissioned by sixth Duke of Bedford in 1814 and installed in a purpose-built temple at Woburn, was removed after it had been judged not to constitute a part or fixture of the building. Only following four years of intense negotiation was the statue jointly bought by the Victoria & Albert Museum and the National Galleries of Scotland. More recently in 2007 Dumfries House and contents were offered for sale by the Marquess of Bute. Those contents included the only fully documented suites of furniture made by Thomas Chippendale. If anything could be deemed a fitting, albeit free-standing, it was surely these Chippendale pieces. Yet they would have been dispersed at auction (for which catalogues were printed by Christie’s) but for the intervention of the Prince of Wales who subsequently helped to establish a charitable trust preserving Dumfries and its furnishings. Alas in Ireland we have no such well-connected champions of the country’s architectural heritage, nor have we shown much concern for preserving the historic contents of our houses. For this reason, the issue of the Bellamont busts is important and could set a precedent. But it is essential that sentiment does not cloud any discussion relating to their removal. Over centuries an inordinate number of works of art have been taken from their original or long-term settings and placed elsewhere, as a visit to any state gallery or museum will demonstrate. To insist that proprietors of historic buildings may not dispose of certain items which have remained in the same location beyond a certain period of time is to trespass dangerously on the rights of private ownership. It could also hinder rather than help the cause of heritage preservation by inspiring antagonism among the very people we are trying to encourage and support. Having seen the busts in place over many years, my ardent wish is that they will be restored to the niches they occupied for so long. But I am also sufficiently aware of the complexities of the case to appreciate this might not happen. The Irish Aesthete welcomes comment on this or any other topic covered here, provided it is expressed in temperate language. This entry was posted in Architectural History, Cavan, Country House, Heritage at Risk and tagged Architectural History, Bellamont Forest, County Cavan, Georgian Architecture, Heritage at Risk, Historic Interiors, Interior Decoration, Irish Country House, Stately Home, The Big House. The reactions to both examples indicates that the balance of opinion has firmly moved towards keeping fixtures in their original locations, however, whether the legal frameworks remain robust enough to enforce this may be less certain. Hopefully the Noseley example has set a useful precedent; at least within the UK. One hopes the busts from Bellamont are restored to their rightful niches. Thank you, these more recent examples from England are most helpful to read about. Of course the issue, in Ireland and elsewhere, is that often interpretation and enforcement of the law are not effective. Without both, then the possibility of historic items being removed from houses will remain a risk. 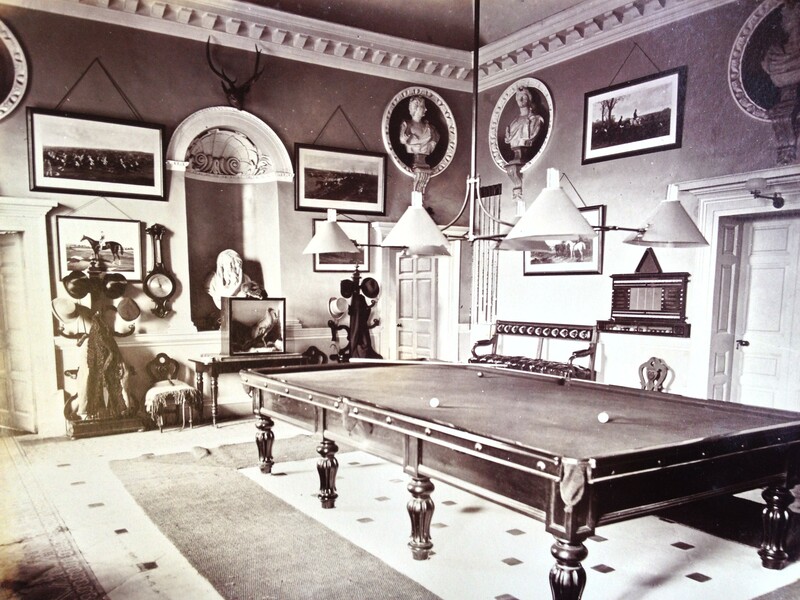 The Victorian decoration, (including of course the billiards table), always throws off the beautiful simplicity of Georgian architecture, as so well shown in the subsequent photographs, when the hall is stripped back to its bare bones. Without getting into the legal niceties, (perhaps an odd description in the circumstances), even without the busts, the room without the Victoriana is a wonderful testament to the architecture we admire. It is true that good architecture is best revealed when stripped of all decoration. Rather like someone with good bone structure. The Fifth Columnist encouraged his readers to visit your blog in his most recent post and I am pleased I did. This article of yours presents a very well reasoned argument and the blog as whole is very interesting. on the grounds that it was integral to the building and encouraged visitors. Perhaps this ruling will provide some comfort to those who, seeking to pay their IHT bill and save the estate, choose to sell the family silver. Thanks for your comments; the question of Reynolds’ Portrait of Omai is of particular interest in this country since when sold in 2001 it was bought by Irish stud owner John Magnier who ever since has been seeking to take the picture out of England. There is also the important matter, raised by the Castle Howard sale of the painting, over house owners selling contents in order to ensure the survival of the house; but at what point does this leave the latter just an empty shell when all the valuable items it once contained have gone. And in the present era, with divorce more frequent and more expensive, pictures and furniture are at risk of disposal in order to satisfy the requirements of a court order. IA, (can I call you that?) absolutely. The whole thing is bloody shocking (once again I have to remind myself that you only accept any comment so long as expressed in temperate language so I will tone it down), why should a man be taxed after death? Why, having paid tax on his income, should he be taxed on the fruits of his astute investments? Kipling’s Five and TwentyPonies comes to mind. You may call me whatever you wish, provided it is expressed in temperate language! Yes, the whole scenario is (bloody) shocking, not least because of a want of logic. I can imagine other legal arguments, as well. “Your honor, the house is damaged and cannot be sold for anything like its value without the damage being made good. The estate is impecunious, therefore, the statuary was sold to raise the funds to repair the damage.” Or, conversely, “Your honor, the estate is substantially reduced in value by the removal of these busts. I charge the executors with wastage, with wanton and malicious damage to the estate…” This kind of common law argument would be especially effective where the modern statutory argument is not entirely persuasive, one way or the other. I find the house fascinating on a couple of levels. One is that, having ancestry from Cavan, from near enough to Cootehill, and given the number of illegitimate children produced on local women by…mmm…Thomas Coote, wasn’t it?…and the passage oif time, I would be terribly unsurprised to discover a blood relation. Secondly, because in reading the biography of Eric Dorman-Smith / O’Gowan I saw so many of my own flaws. Thanks for your observations. The opportunities for lawyers to enrich themselves in a case like this are almost endless, not least because trying to reach a definitive result will be difficult. Happy to keep you and other readers up to date should there be any further developments on the future of this very important house. Oh, and the third point of interest, O’Gowan used to ket the IRA train there and, oh, well, I have some ancestry in that, too. No idea if the old one ever did train there, mind you. I saw a reference on Facebook saying that the damage to the interior of the house was deliberate and extensive. It’s a great shame, if so. I’ve done them, back when I was in practice; nobody wins estate fights except for the lawyers, no. Other than what has been caused by the bad weather in recent years, there has not been damage to the interior, deliberate or otherwise. And yes, the IRA connection is well-recorded. Ah, thanks. Deliberate pillage disgusts me, so I appreciate knowing that has _not_ happened. Very interesting story and case indeed – such a shame that the greed for money is so much stronger than the considerations for such an important architectural masterpiece where ofcourse the busts should have been preserved in situ. That said the room still looks fantastic even without the busts. The Bellamont Busts have found themselves in a can of worms. Firstly, they do not seem to have been authoritatively documented re size, weight, medium, author/sculptor, date nor condition. Cavan County Council, and others, are seeking the return of objects about which they know very little other than what can be gleaned from photographs and from those who have actually seem them. Copying or reproducing is part of the craft of the sculptor so how does anyone know that the busts in the first early photograph are the very ones in the latest photograph? Today it is possible to have a copy of an object made from nothing more than a photograph so, without impugning the estate trustees, how will anyone know that what they may return are the busts which seem to have been removed. In Rumsfeldian terms, it is known knowns that we are after. I fail to see the fuss about objects that have very little value other than the intrinsic value of the medium in which they have been made. With no attributed sculptor, no date, no provenance of origin and no idea of whom they are likenesses, these are only portrait busts of other peoples’ ancestors. These kind of things are two a penny at country auctions. Bringing Canova into the picture is just not valid. I cannot see either how they could be considered fixtures. How I am now to treat the marble bust of my great grandmother which is neither signed nor titled and stands on a landing windowsill? I hope the County Council has thought of the consequences of its court order in terms of what the estate trustees mght consider a vexacious action which may have further diminished the sale price of this fine property which has already fallen from 7.5 to 1.45 million. The niches look so empty now that a new owner would almost certainly refill them and perhaps this time with important and documented artwork which completes the visual aesthetics of the objects and the room they decorate. Interested, yes, but not as a buyer. The judge needs to realise that objects can have deep sentimental value to their owners while at the same time having little or no market value. And also they can have market value _and_sentimental value. The Bellamount busts must be returned ! Bellamont is basically the only country house in Cavan now worthy to be deemed with any consideration . The most recent late Mr.Coote himself was only an ancestor of the original family and really didnt hold Bellamont long enough or reside in Bellamont to deem any kind of sentimentality to the place. dare I say it a blow-in , and before I come up for criticism I am merely pointing out he didnt directly inherit the place but purchased it and I say fair play and well done to him . He embarked on magnificent work in the preservation and highlighting on the georgian architecture . It is my opinion that the busts would not have been removed if they had no market value , simple as…… it would be much more interesting and valuable to throw the house open on selected days and engage the paying public in tours of the house and grounds , there is always a market for this and a fine example like Bellamont will more than wipe its own face . It would make better business sense to hold onto it as a going concern/investment than to try and sell it in the current market , unless ofcourse I am successful with the lottery whereas I will gladly purchase the place for future generations and architecture enthusiasts to come and enjoy . There is an old pdf online with the original sale details. There seems to be some ambiguity regarding the use of the linen hall and steward’s house. The buyer is invited to apply for the appropriate permissions to adapt for domestic, commercial or office use. Apparently the extensive work done here did not have planning permission. Could this explain the massive drop in price? Thank you for this: I wonder if you could send me a link to the pdf you mention, it would be much appreciated. As for the house and its price, I am afraid the situation there is much more complex than simply an outcome of whether or not planning permission was granted for the specific work undertaken some years ago on the outbuildings. commercial or domestic use subject to planning permsissions. I am genuinely shocked to read this; it is terribly sad. It should be noted that chandeliers (which had seemingly always been there) were sold-off from the house in the 1980s, before John Coote purchased the place. Again, the issue of what constitutes a “permanent fixture” arose there – though I’m not sure that this matter was ever made public at the time. The argument of what constitutes a “permanent fixture” aside, for a moment: who removed these busts? If they were stolen, then this is surely a matter – first and foremost – for the Garda. I also note that a couple of years have passed since this happened; has there been any progress on recovering the busts?